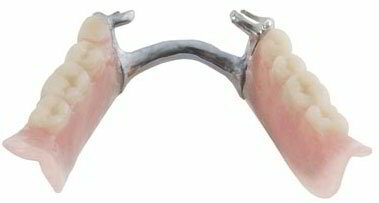 Complete dentures replace all of the teeth on either the upper or lower jaw. 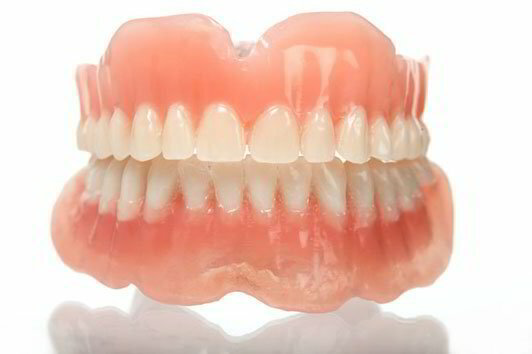 Complete dentures are made from prefabricated acrylic and sized to fit the shape of your jaw and mouth. They mimic the colour and appearance of your natural teeth. The unique impression of your teeth, bite, and the shape of your jaw shape will be used to create the dentures. Typically, conventional complete dentures require a one-to-two month wait after the extraction of your teeth, so that your mouth and gums will have time to heal, permitting a more accurate fitting. However, if you cannot afford to be without the missing teeth even for a short time, dentures can be inserted immediately after the extraction. Over time your mouth will change, but your dentures will not. The jaw bones and gum can shrink or recede. You can have your dentures remade or refitted when necessary. Partial dentures are removable devices that replace a few missing teeth, instead of all the teeth on the jaw line. They can be attached either by metal clasps or precision attachments. Precision attachments require crowns to be put on the remaining abutments teeth that hold the partial dentures in place. Regardless, these supporting teeth must be in good health.